Are The New Generation of Portable Scanners Good Enough For Your Office? In the past few years we have seen through sources such as ars technica and Lifehacker, the portable document scanner has been something of a hit and a craze amongst consumers; however, their main target is businesses who need to digitise their documents on the go. The question is, are these portable document scanners up to the quality we come to expect from our standard desktop scanning equipment and can they be used effectively in an office environment? The portable scanner that caused the most buzz was the Doxie Go. It had been featured in all kind of tech blogs and magazines and was widely being hailed as the next digitisation master-stroke. However a lot of people have thought more pessimistically about the advantages of a smaller, portable document scanner. Inevitably when we make something smaller and considerably more compact you are bound to lose some of the quality. As featured in ars technica’s in-depth review of the Go in 2012, they discussed the quality of the output in comparison with a regular consumer all-in-one desktop scanner. The results showed that, while the Doxie Go is very good at what it does, it’s not quite good enough to output quality scans for the likes of colour documentation, leaflets and such; however, its output seems to suggest that it would be at the very least acceptable in an office environment. It’s true that the Doxie Go could potentially be a little revolution for the document scanning world, but is it plausible in an office environment? In our opinion, potentially yes, but it has distinct downfalls that can hold it back, especially if you get a wide variety of documents on a daily basis. 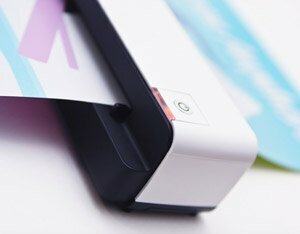 The Doxie Go and other similar devices don’t have double sided scanning which can be an important thing to have for a lot of companies that use both sides of the paper. This could add considerable time to the whole digitisation process. It’s also arguably that, at 512mb, the internal hard-drive of the Doxie Go is rather limited although this can be fine if you can scan a number of documents which you would then output onto your computer system. Although these devices are becoming a lot easier to use with excellent software, they are still heavily limited in a busy business environment. Where the likes of the Go would shine though is within smaller environments where you only have to deal with a smaller amount of documents per day, for example, post. The Doxie Go also retails at quite a high price and at £159 it’s not cheap, but if you need a small, portable device to keep a small flow of documents in check after a larger digitisation exercise, then the Doxie Go might be the way to go. If you’re wanting to go paperless with ease, something like the Doxie Go would not be a recommended process but it would be able to help you after with the continuous flow of paper-based documents that would come in to you. For those seeking a paperless office it’s recommended that you outsource to a document scanning and digital document management company like ours to remove the bulk of your documents before you start going around with a little portable so check out our website for further information on the document scanning process and making your office paperless.